By Chris Williams: Roy Jones Jr. unbelievably believes that the tiny 5’6” lightweight champion Vasyl Lomachenko presents a more dangerous fight for Mikey Garcia than IBF welterweight champion Errol Spence Jr. Mikey (39-0, 30 KOs) is talking of moving up to welterweight to challenge Spence for his International Boxing Federation title in November or December. The fight is thought to be an insane move on Mikey’s part in facing a guy that is much bigger, taller and more powerful than him in Spence. It’s generally thought that Mikey just used Spence’s name to get some cheap attention from the boxing public to have them focus on his unification fight against IBF lightweight champion Robert Easter Jr. last month, as few fans were excited about that fight until Mikey started name dropping Spence’s name and talking about wanting to fight him in December. “You have pound-for-pound one of the best fighters in the world in Lomachenko, but because of promotional disputed, the fight probably won’t happen,” Roy Jones Jr. said of a fight between Mikey Garcia and Lomachenko. “I never seen Mikey that big,” Jones said about Garcia moving up to welterweight to fight Spence. “I don’t know how he’ll fight with the weight change. We haven’t seen Spence in with an experienced fighter. There are a lot of questions that will need to be answered. He’s going to need to try and use his experience, but he’s not going to be able to out-box Spence,” Jones said. It’s nonsense that Lomachenko is a more dangerous fight than Spence for Mikey. Spence can hurt Mikey. Lomachenko lacks the punching power to hurt Mikey. If Lomachenko does make the mistake of slugging with Mikey, he could end up on the seat of his pants. Jorge Linares knocked Lomachenko down in their fight. If Lomachenko slugs with Mikey, he could get hurt, especially with his surgically repaired shoulder. Mikey could wind up as Chris Algieri 2.0 when/if he gets inside the ring with Spence. Algieri fought most of his career at 140. However, when he fought Spence at 147, he was mowed down in five rounds. Spence had too much size and punching power for Mikey. The thing is the 5’10” Algieri would have a huge size advantage over Garcia if the two of them were to face each other. I wouldn’t be surprised if Algieri beat Mikey. ”The only chance he can have against Spence is to have more heart,” Jones said about Garcia. ”Most of the fans in the United States aren’t in tune with Lomachenko because he’s not familiar here. All of the U.S fans are in tune with Errol Spence. So he [Mikey] gets more bang for his buck to go against Errol Spence than he does against Lomachenko. But Lomachenko is a much more dangerous fighter; mainly because of his skill factor,” Jones said. It goes without saying that the U.S boxing public would be much more interested in seeing Spence fight Mikey than Lomachenko. The reason for that is because Spence is in a much more popular weigh class than Lomachenko in fighting at welterweight. The casual boxing fans aren’t all that interested in following fighters from the 135 weight class in the United States. Additionally, Spence has a more exciting fighting style than Lomachenko, who wins his fights by tapping his opponents with weak shots until they quit. Lomachenko doesn’t sit down on his shots, and it’s not nearly as interesting for boxing fans watching his fights compared to Spence’s. Lastly, Lomachenko fights on ESPN+, and there are a lot of fans that don’t want to pay for the subscription service. Most of the fighters that ESPN+ streams are Top Rank fighters, and there aren’t any big sluggers with. Top Rank guys Terence Crawford, Lomachenko and Gilberto Ramirez are volume punchers. It’s more interesting for boxing fans to see Mikey fight Spence because it would be such a mismatch on paper. Mikey vs. Lomachenko is more of an even fight. It’s also a fight that probably will never happen due to Lomachenko being promoted by Mikey’s old promoter Bob Arum. Negotiating that fight could prove to be impossible. It’s nice to think about a fight between Mikey and Lomachenko, but it’s still unlikely to ever happen. Mikey has a better chance of fighting former Top Rank fighter Manny Pacquiao than he does of ever fighting Lomachenko. I think that fight is virtually undoable for an entire lifetime. Mikey vs. Spence is a more entertaining fight on paper because Spence will be on a seek and destroy mission. He won’t be looking to tap Mikey into submission the way Lomachenko will. Spence doesn’t waste time showboating like Lomachenko does. 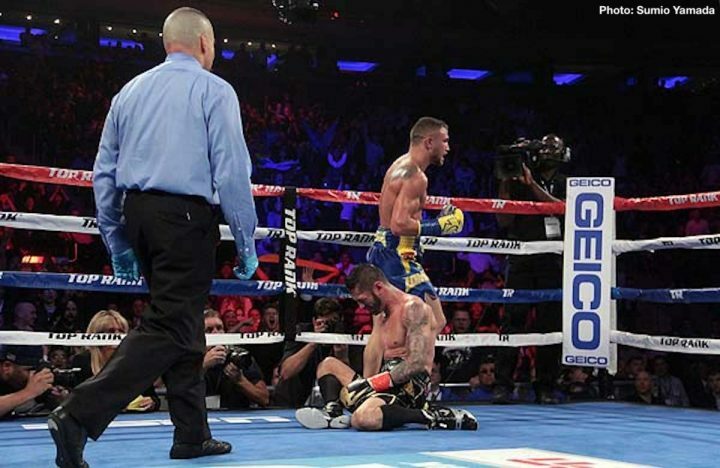 It’s boring for fans to see Lomachenko showboating. If he had some punching power, it might be interesting, but he only throws tapping shots. Jones Jr. must be forgetting Spence’s win over Kell Brook last year. Brook is a high quality fighter, and Spence stopped him in the 11th round to take his IBF welterweight title last year. Lomachenko’s win over Guillermo Rigondeaux wasn’t that impressive because the Cuban fighter had to move up two weigh classes and fight him at super featherweight. It wasn’t a fair fight for Rigondeaux due to the climb in weight that he had to undergo. If Lomachenko moved up two weight classes to fight Spence, he would be in the same position than Rigondeaux was in when he moved up to 130 to fight him last December. Lomachenko would be at great risk in fighting Spence. I don’t think Lomachenko would ever take that kind of risk unfortunately. Rigondeaux was willing to do it because he has a warrior’s hurt, but I don’t see Lomachenko taking that kind of risk. ”I prefer to see him [Mikey] fight Spence, because as a fan, the Lomachenko fight isn’t going to draw the attention the Spence fight is,” Jones said. ”As a fan, Spence and Lomachenko are two different fighters. One guy is world class because of his [boxing] skills. One is world class because of his power and determination [Spence]. It’s two super fighters. Him and Spence is a very, very exciting fight. If he [Mikey] gets the weight right, like I think he will do, we don’t know who might win. There’s a more even playing field type of fight. I don’t know if he would beat him, but I would think that Lomachenko would have an advantage [over Mikey] because of all of the experience,” Jones said. Lomachenko would likely beat Mikey if that fight took place, but he sure won’t beat Spence. Mikey is beatable, but Lomachenko won’t do that against Spence. Lomachenko will never take the risk of fighting someone like Spence, which is why his popularity will never go beyond a certain level.